The Destination Village for VOR 2011-12 Sanya Stopover is scheduled to open to the public on 4th Feb, according to sanya.gov.cn. Covering a land area of 35,000 square meters, the Destination Village is equipped with a 3D cinema, navigation simulators and other facilities to let visitors experience the sailing of Volvo Ocean Race. One of the highlights in the village is the Exhibition Hall of Volvo Ocean Race, which is the largest exhibition hall in the Sanya Luhuitou Peninsula Yacht Dock. The two-storey hall occupies an area of 500 square meters, with a height of 18 meters. The first floor introduces the history and development of VOR through multi-media and exhibits Volvo trucks and sedan cars. The second floor is home to a VIP reception area and meeting rooms. 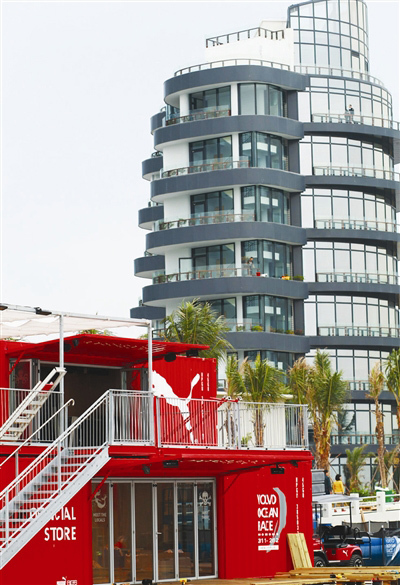 In addition to the VOR Exhibition Hall, other featured pavilions will be open to the public during the event, including Abu Dhabi Pavilion, Camper Pavilion and Puma Pavilion. In addition, folk dance performances, fireworks show, rock and jazz music show and a singles party will be staged during the fortnight period.